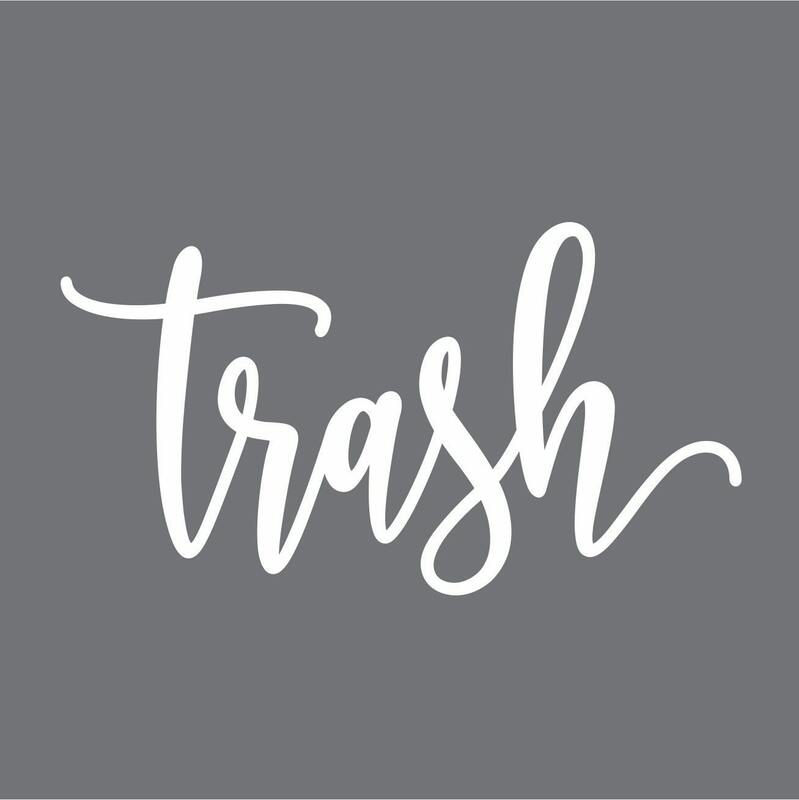 TRASH DECAL. 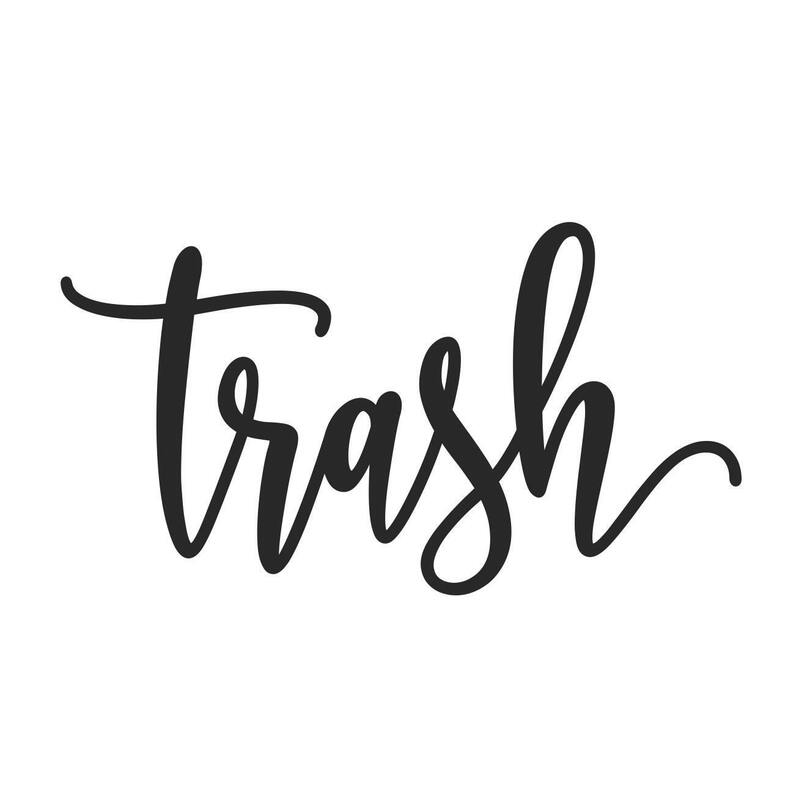 Trash vinyl decal in a casual handwritten script style letter. 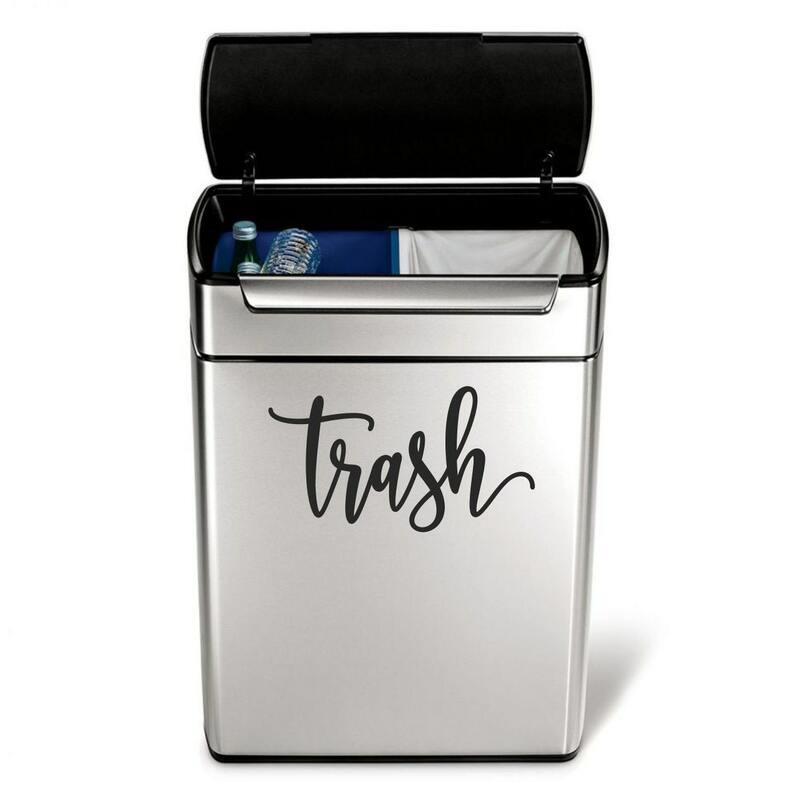 Decorate a plain garbage bin or plastic recycle tote with this easy-to-apply vinyl decal. Available in a variety of sizes and colors. - gloss vinyl suggested for containers with heavy use. • Apply to smooth surfaces like walls, glass, metal & plastic. WHY PURCHASE FROM FAIRY DUST DECALS? • 30 years of experience • 5 star reviews • made in the U.S.A.
Fairy Dust Decals accepts Paypal and all major credit cards through direct checkout. • USA ORDERS - All orders are shipped first class or priority mail via the US Postal Service. Tracking numbers are provided for all orders. Please contact me if your order has not arrived and I will try to track its location. Incomplete and wrong address information will delay shipment of your order. • INTERNATIONAL SHIPPING - not available. • EXPRESS SHIPPING - not available. • GIFT WRAP & GIFT MESSAGE - not available. • RETURNS & EXCHANGES - Fairy Dust Decals is unable to offer returns or exchanges for custom orders, personalized names, personalized wedding decals, and personalized baby or bridal shower decals. Fairy Dust Decals is not responsible if the decal will not stick to your walls or if your decal is damaged due to human application error. Returned decals must be shipped back in original, unused condition. Buyers are responsible for all returned shipping costs. • PRODUCTION TIME - All decals are made-to-order, not precut. All decals are cut, packaged and shipped only by me. Important information like names/dates/colors must be typed into the note section located on the order/payment page or the personalization box. Missing information will delay shipment of your order and may result in a cancellation and refund due to lack of required information. • APPLICATION OF DECALS - Each shipment includes easy-to-read instructions with photos. Please read the instructions in full and follow them step by step. Feel free to contact me with any application questions. Vinyl decals will stick to many smooth surfaces like metal, plastic, glass, mirrors, laptops, sealed wood, marble, tile & more. Textured surfaces (stucco, brick, cement block, unfinished wood) are not recommended. This is a do-it-yourself product and human error can occur if the directions are not followed. Fairy Dust Decals is not responsible for any surface damage that may occur upon application or removal. There are many videos on youtube about vinyl application. • ABOUT VINYL WALL DECALS - No stencil, no paint, no mess! Fairy Dust Decals are made from thin, self-adhesive matte finish Oracal brand vinyl. When applied to a smooth surface, the design will look painted on your wall. The low-tack adhesive allows for easy removal without surface damage or leftover residue. Wall decals are removable, but are not able to be repositioned or reapplied. My decals do not have a background color or a clear outline. • IMPORTANT INFORMATION ABOUT WALL PAINTS - All decal orders include a free test decal. Apply the test decal first before applying your main decal and let the test decal sit for at least 24-48 hours. Some new wall paint brands may contain an additive which may cause the decal to peel, bubble or lift off. This paint additive is the same ingredient that resists crayons and magic marker. Oracal brand vinyl suggests waiting at least 4-6 weeks to apply decals to freshly painted walls. There are no refunds for decals if they do not stick to your painted surface. • WALL DECALS & CHILDREN - Please monitor children of all ages around wall decals. Wall decal pieces could become a choking hazard if peeled off and ingested. Fairy Dust Decals is not responsible for any injury due to a child swallowing a wall decal. Fairy Dust Decals does not ship to the EU or other international countries. We only use customer information to fulfill orders and do not store or use customer information for any other purpose. Information such as name, shipping address, and email address is not stored on our computers. If and when required, we will make contact to communicate with you about your order status using the Etsy platform. GLOSS vs. MATTE VINYL: Gloss vinyl is used for items that are frequently handled or may be exposed to the weather. Gloss vinyl is perfect for wine glasses, bottles, canisters, trash barrels, car windows, boat and vehicle lettering, and exterior signs. Gloss vinyl will stick to most smooth surfaces like glass, metal & plastic. Matte vinyl is perfect for interior signs, laptops, walls and decorative items. Matte vinyl will also stick to most smooth surfaces like walls, glass, metal and plastic. Matte vinyl is easily removed and will not leave any adhesive residue. Every decal order includes a free test decal. Apply the test decal first to your wall or item and observe it for 24-48 hours. If the test decal lifts off, bubbles or wrinkles, it means that the surface of the item or wall paint is not compatible. Decals will NOT stick to Low VOC, stain-resistant paint, or the new paint/primer in one wall paints. Both the vinyl manufacturer and paint companies recommend that freshly painted walls should have 6+ weeks of full drying time. Textured surfaces are not recommended. Fairy Dust Decals is NOT responsible if your decal will not stick. Please remember that vinyl decals are a do-it-yourself project. Following the step-by-step instructions is very important to have success with your decal project. A complete current address with first and last name is required in order to print shipping labels. Tracking information is provided for USA shipments. Please understand that once a package is shipped, it is out of our control when the package will arrive. Delivery delays may occur during the holidays and bad weather. PLEASE contact me if your package does not arrive. Do you make custom designs? APRIL 2019 - currently not taking custom design requests. Yes and no - it depends on the project size, color and the description of your project. During the busy holiday shopping season, I do not offer custom orders. Please do not request for me to copy other shop's designs or reproduce trademarked logos. Please send me a convo message on Etsy or email me at fairydustdecals@comcast.net with information about your custom request. How to leave important information for Fairy Dust Decals? All important information can be typed into the note section located on the order/payment page or into the personalization box on many of my listings. Simply type required information like names, dates and color choice into the box. The box is NOT for substituting words or changing the decal design. If an order is placed with a unauthorized design/word change, the order will be canceled and refunded back to you in full.